Side1 printed with four-color process. 12pt C1S Semi-Gloss stock coated with Aqueous Gloss. H1 business card slits on right pocket. 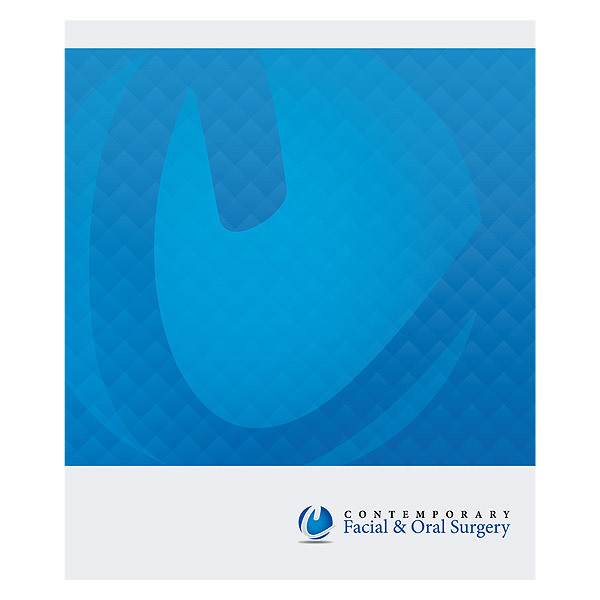 Contemporary Facial & Oral Surgery stays classy and simple with an enlarged logo occupying almost the entire cover. The "C" placed on the blue bulb both reinforces Contemporary's identity and mimics the oblong outline of a person's head. Cool blue tones soothe the eye and mind, relaxing recipients who may be nervous about an upcoming procedure. The inner pockets provide an extensive list of Contemporary's services, as well as a URL and a small version of the "C" logo. Blue lines along the bottom of both pockets bring a hint of color to the interior. Side 1 printed with 2 PMS colors using heavy coverage. 12pt C1S White Semi-Gloss stock coated with Aqueous Satin. V4 business card slits on right pocket. 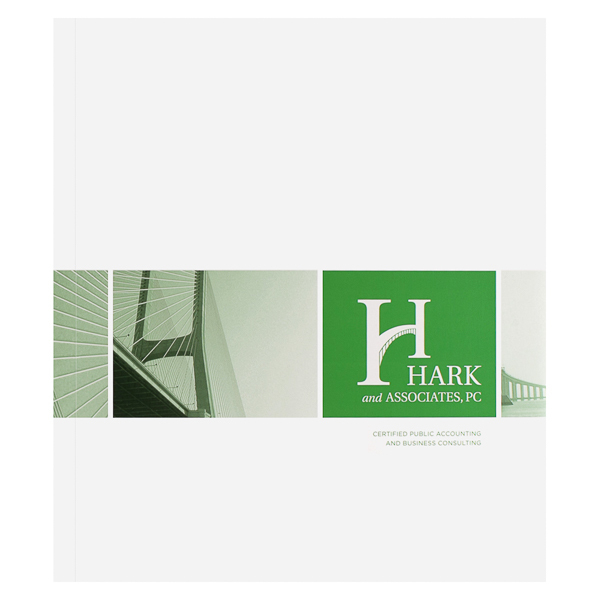 Bands of photos on both covers depict the suspension bridge after which Hark & Associates' "H" logo is modeled. The bands are colorized with the brand's signature green, a fitting color for an accounting and financial planning firm. Green contact info maintains the color branding while still standing out on the white back cover. Four-color process and 1 PMS color printed on Side 1 of 14pt C1S White Semi-Gloss stock. Coated with Aqueous Soft-Touch. H1 business card slits on right pocket. 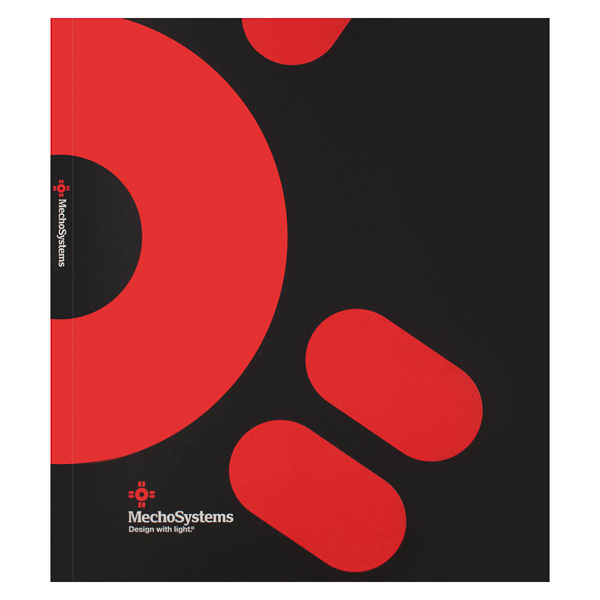 MechoSystems' bright red logo spans both covers and prompts viewers to open this intriguing design. Powerful black panels and pockets hint at MechoSystems' role as a provider of shading and room-darkening solutions. White contact information is printed on the back cover, where it's readable yet out of the way. Four-color process printed on Side 1 of uncoated 100lb White Smooth stock. H4 business card slits on right pocket. Blue boxes positioned away from the panels' sides draw attention to the folder's expansion scores and reinforced edges. 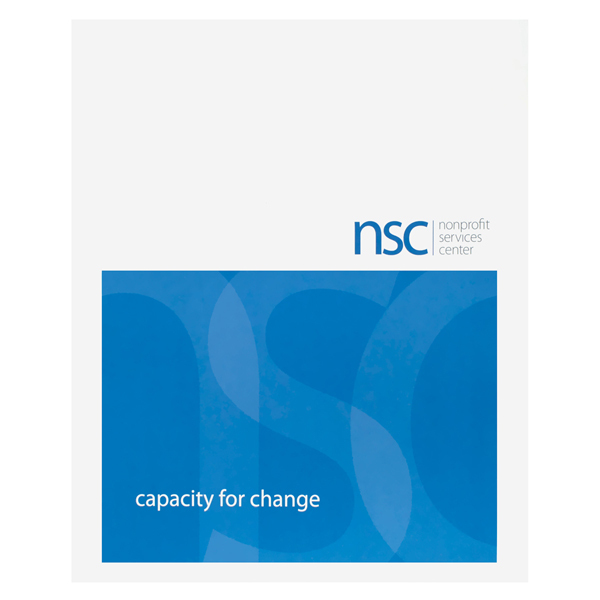 An opaque logo in each box plays up the Nonprofit Services Center's identity as an educator, trainer, and consultant for nonprofits in Missouri and Illinois. Curved letters add motion with their smooth, round lines, while different shades of blue create variety to engage the viewers' imaginations. Two expandable pockets can each hold up to 1/4" of 8 1/2" x 11" documents, thanks to a double-score backbone that accommodates their ½" combined carrying capacity. Sturdy 1" reinforced edges along both panels protect the contents without bending, breaking, or wrinkling. Add a custom design to the edges and pockets to spice up the interior. Dimension Closed: 9 7/8" x 11 3/4"
Dimension Open: 20 1/4" x 11 3/4"